Hide those ugly basement poles with our wood pole covers. Round Wood Paint Grade: 1 Year warranty. Designed for the exterior. Products in this category have not been load-tested. Sold for decorative purposes only. 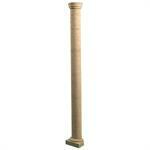 Hardwood Columns. Fireplace hardwood mantle columns: Many designs shown.